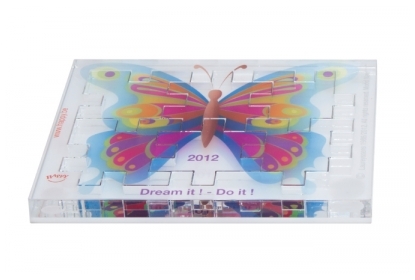 Happy Cube Acrylic puzzle with digital full colour print. The Happy Cube Acrylic is an executive gift to puzzle fans. Give this collector item to your premium customers. The acrylic material is standard available in transparent and opal. The delivery time is 3 weeks. On request, we supply several colours. Your logo or message on the cubes, can be engraved or printed. Standard packaging will be in a cardboard box. Ask for our other luxury giftboxes. The Happy Cube Acrylic is © D. Laureysssens 1986.